They say Ironman is addictive and I can verify the comedown isn’t great. But I don’t want this to be a negative blog. I have to reflect on what I achieved and my body and mind need time to recover from a twelve and a half hour bashing. So let’s get the numbers out of the way. Swim 1.08, bike 6.38, run 4.26. T1 8.05 (yes I made a cuppa and stopped for the loo) T2 7.12 (another loo stop and a frothy cappuccino this time.) Total time 12.28. I finished 32nd in my age group, 1777 overall. I’m still not sure how I swam 2.4 miles in under 70 minutes; almost ten minutes faster than my previous best. I lined up on the edge of the cooling Worthersee waters alongside my brother. I figured I would be calmer if I stuck by him right until the start. It worked. I felt really positive when the canon went off at 7am, to signal the final part of my year long Ironman journey. As I started to swim, I didn’t even have time to think about the 2,600 other athletes in wetsuits around me. I just tried to get into a rhythm and ignore the blows to my head, arms and legs. Sighting was really hard, but I’m pretty good at going in a straight line, so I don’t think I went too far off course. But throughout the whole swim I felt like my pace was really conservative and I didn’t appreciate just how much benefit I was getting from drafting those around me. When we reached the 900m long canal section, the water was as cloudy as Worthersee is clear. It was impossible to see anything beneath the surface, but every time I breathed to the right, I could see supporters on the banks and hear their cheers. It made me feel good and I knew the swim was nearly over. I exited the water with a huge smile on my face. It grew even bigger when there was an “alright H?” to my right. It was my brother. I couldn’t believe it! Despite not having a clue where he had been for the last 68 minutes, for the second triathlon running, we exited the water at the same time. It was such a special moment. Starting the bike leg I felt nervous. I’ve mentioned before it’s my weakest area. I was worried I’d puncture and I wasn’t sure if I’d go under seven hours. That was something I was desperately hoping to do. 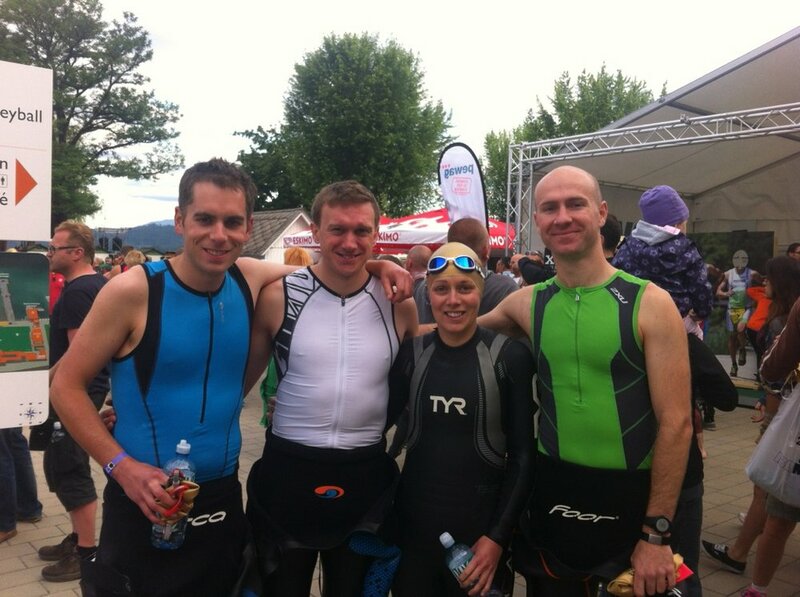 It would prove to me I had progressed since last year when I did 3.30 for 56 miles at Rapperswil-Jona 70.3. I was very much in the minority on a road bike with aero bars. My old mountain bike helmet didn’t fit in either. But it made passing middle aged men on TT bikes with aero helmets and the obligatory shaved legs feel so much better! The bike course was stunning; two 90km laps through beautiful Austrian countryside. The roads were smooth and while the course wasn’t flat, there were enough supporters lining the climbs to help you get to the top. I smiled constantly and felt brilliant both times I passed our “Fuelled by Cake” support crew. There were some really lonely moments but I had done plenty of long rides on my own and I was surprised how quickly the time passed. My nutrition plan kept me focused. I ate a piece of Clif bar every ten minutes, apart from once an hour when I had 5 sips of SiS energy gel/water mix. I drank lots of water with Nuun tablets too. I was grateful I had practised the art of grabbing bottles and refilling my aero bottle on the go. It meant I didn’t panic at aid stations on race day and I took on the liquid I needed. I had to stop to go to the loo twice, but I knew that was a good sign. When I got into T2 I was pleased I had finished the bike in under seven hours. I still felt like I should have been able to go faster. Let’s just say it’s something to improve on for next time! So it was on to the run. A mere 26.2 miles lay between me and the finish chute. In my head I was questioning how on earth I was meant to do a marathon after nearly 8 hours of non-stop exercise. But physically I felt surprisingly ok. I changed my socks, put blister plasters and suncream on, grabbed my cap, ate a few mouthfuls of pretzel (even in an Ironman I had to feed my addiction) and headed into the afternoon sun. Within a hundred metres I realised I had left my fuel belt in transition, but I decided not to go back for it. It only had energy gel blocks in it and I really didn’t think I could stomach them. My plan was to run for nine minutes and walk for a minute. I had done it in training, it had worked at Bala middle distance triathlon and I was confident it would get me to the end. But I struggled to hit the right pace. I started off far too quickly and I soon realised the nine minute plan was going to go out the window. My run would be dictated by the aid stations which were 2.5km apart. It didn’t take long to start feeling the intense heat on my back, but the relief of not being cramped up on a bike helped me get through the first few kilometres. I smiled at any GB supporters I could see, hoping they’d shout encouragement at me in return. Seeing the bright yellow Fuelled by Cake gang was a real boost. They were right in the middle of the figure-of-8 course. I’d pass them once every 10 km. Mentally that was vital to know. At half way I still felt ok and I looked at my watch. If I could maintain my pace, I would be on for finishing in around 4.15. But the further I got into the marathon, the less my body felt like putting one foot in front of the other at any sort of speed. I didn’t want to take on any more liquid, because it had started to slosh around in my stomach. But at the same time I was really thirsty and the last 10km were a real battle. I just got slower, but I was pleased I was mentally strong enough to make myself run from aid station to aid station. I just wish I had been able to do it a little faster! The message on the back of my tri top helped to keep me going - thanks Chrissie! When I hit the 1km to go marker I inevitably sped up. The last few hundred metres were amazing. There were supporters everywhere, crammed behind safety barriers on either side of the blue carpet. I could hear the loud speaker and I could hear those words being said in the distance. I came around the final corner, grabbed a welsh flag from my boyfriend and then it was my turn to be told “YOU ARE AN IRONMAN.” I didn’t cry when I crossed the line, I just felt numb. And for the first time since getting out of bed at 4am, I was wobbly on my feet. It was the shock of completing the race in one piece with my family, boyfriend and friends there to watch. It took a good week to sink in that I actually finished an Ironman. It’s been really hard to make myself rest, but it’s been even harder to adjust to not having a goal. I feel a bit empty. But I know there’ll be plenty more challenges ahead. A life without pushing yourself and achieving things you didn’t think possible would be a very boring one! But for the time being I’m just trying to relax and enjoy a guilt-free cold beer or two. I’m still trying to make up for the fact I only managed three sips after I crossed the line in Klagenfurt.